Former NATO intelligence chief writes cyberterrorism spy thriller – Major General Val Pattee's novel lauded as compelling and a "tutorial for homeland security personnel". Suppose al-Qaeda had a second, potentially more devastating attack planned in 2001. How would it be thwarted? 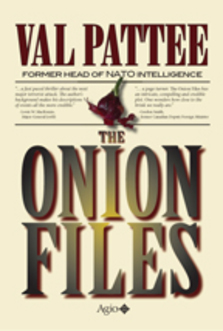 "The Onion Files" is a spy thriller differing from all previous novels in one very important aspect: author Val Pattee was one of the Western world's top spy masters. Serving as chief of intelligence for NATO in Europe during periods of Cold War-era terrorism, he worked with the heads of intelligence for sixteen member nations, and conferred with his Soviet and Red Chinese counterparts. Although "The Onion Files" is fiction, Pattee infuses the action with a realism of people and places only an insider could deliver. The title refers to an ingenious and diabolical plot by al‑Qaeda to devastate vast areas of the United States soon after the 9/11 attacks. Pattee introduces readers to protagonists Jim and Mark Buchan, who work with the US Central Intelligence Agency and Russian counter-terrorism units in a fast-paced hunt across three continents to halt a computer virus and its brilliant creator. We will send The Onion Files to your Kindle at . The Onion Files has been sent successfully to your Kindle!